LOCATION - Less than 3 miles from Main St. HOSTS - Cabins have separate entrances, but are attached and located on the same property. Perfect for couples traveling together. Host lives nearby, but privacy is guaranteed. SLEEPS - 2 people per cabin King Bed. Cabins can be rented separately or together. BATH - Each cabin includes a spacious shower. KITCHEN - Each cabin includes a mini fridge, microwave & Keurig coffeemaker. BREAKFAST - breakfast bars and snack basket provided with coffee & tea.
. Coffee, tea, and popcorn provided. 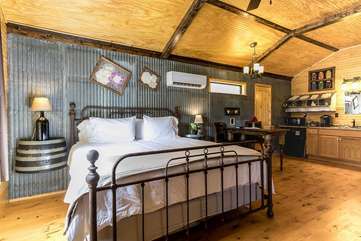 Enjoy your stay in one or both of these quaint cabins nestled just seven minutes and under three miles from historic downtown Fredericksburg, with easy access to all local attractions. The property consists of two private cabins, which can be rented together to accommodate up to four people, or booked separately for two. The cabins are adorned with unique antique accents that make your stay in the Hill Country a rustic experience. They incorporate elements and materials from a local rural schoolhouse as well as a 1900’s family barn, along with modern amenities such as 55” flat-screen televisions and king-sized beds. Each cabin also includes a mini fridge, microwave, Keurig coffeemaker, table and WiFi- making your stay feel like a home away from home. After enjoying your day visiting wineries, shopping on Main Street, sipping on locally produced wines and beer, and dining at one of the many restaurants that offer authentic German and Texas favorites, you can expect to relax on the spacious porch in front of a country view. Located nearby is the owner’s house and bakery, from which The Bakery Haus gets its name. You can expect complete privacy - making your weekend at The Bakery Haus a truly sweet stay. My mother and I really enjoyed our stay here! The location was perfect, and the suite and amenities were amazing. Check-in and check-out were very easy and we really appreciated the free silver earrings we also received as a guest here! We will definitely return here and recommend it to others.